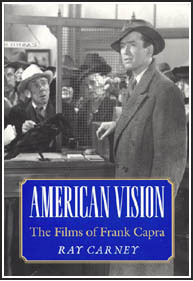 Ray Carney, American Vision: The Films of Frank Capra (Hanover, N.H. University Press of New England, 1996), 88 illustrations, paperback, 510 pages. This book is available directly from the author for $20. The first interdisciplinary study of Americas best-known filmmaker. In this daring and unorthodox study, Ray Carney places the work of Frank Capra in the great tradition of American transcendentalism–along with paintings by Homer, Eakins, Sargent, Hopper and the writings of Emerson, Poe, Hawthorne, and William and Henry James, among others. Interweaving wide-ranging discussions of American literature, drama, and painting and the work of other filmmakers with detailed analyses of such films as It's a Wonderful Life, Meet John Doe, and Mr. Smith Goes to Washington, Carney finds in Capra's life and work a classic American struggle for self-expression within the repressive structures of ordinary life. In this larger cultural context, Capra emerges as something far more radical than the social realist he is often taken to be–as a visionary determined to unleash "mysterious, distinctive, personal energies that defy social understandings or control." American Vision was reprinted in 1996 with a new Preface outlining recent developments in Capra criticism, and detailing the shortcomings of current Cultural Studies approaches to his work. This book is available through Amazon, Barnes and Noble, your local bookseller, or, for a limited time, directly from the author (in discounted and specially autographed editions). See below for information how to order this book directly from the author by money order, check, or credit card. Clicking on the above links will open a new window in your browser. You may return to this page by closing that window or by clicking on the window for this page again. Ray Carney has the longest and most ambitious essay he has ever written about film and philosophy in the following book. The essay is more than 40,000 words long. (University of North Carolina Press, 2000), 225 b&w illustrations, paperback, 472 pages. This book is available directly from this site for $29. The modernist movement has shaped our era as has no other. This insightful collection of original essays explores the impact of modernism on American culture and the ways in which modernism remains a key to understanding American art and society. An impressive cast of scholars examines works and their creators across the whole spectrum of artistic expressionófiction and poetry, painting and sculpture, architecture, dance, photography, and film. In fresh and provocative essays they explore how the ideas of modernism helped shape such artistic expressions as the writings of the Harlem Renaissance, the paintings of Edward Hopper, New Deal public art projects, and George Antheils Ballet Mècanique. Extensive use of color and black-and-white illustrations results in a book that is as appealing visually as it is stimulating intellectually. The contributors are Casey Nelson Blake, Robert Cantwell, Ray Carney, Thomas Fahy, Lucy Fischer, John F. Kasson, William E. Leuchtenburg, Lucinda H. MacKethan, Randy Martin, Carol J. Oja, Miles Orvell, Joan Shelley Rubin, Jon Michael Spencer, and Maren Stange. This book is available through Amazon, Barnes and Noble, University of North Carolina Press, your local bookseller, or, for a limited time, directly from the author (in discounted, specially autographed editions). See below for information how to order this book directly from the author by money order, check, or credit card. Clicking on the above links will open a new window in your browser. You may return to this page by closing that window or by clicking on the window for this page again. 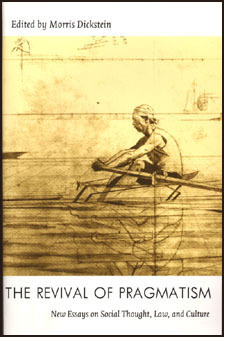 For another discussion of American painting and culture by Ray Carney, see: "When Mind is a Verb: Thomas Eakins and the Doing of Thinking," in Morris Dickstein (ed.) The Revival of Pragmatism: New Essays in Social Thought, Law, and Culture (Durham, NC: Duke University Press, 1998), 5 photographs, paperback, 464 pages. This book is available directly from this site for $25. Available through Amazon , Barnes and Noble, your local bookseller, or, for a limited time, directly from the author (in discounted, specially autographed editions). See below for information how to order this book directly from the author by money order, check, or credit card. Clicking on the above links will open a new window in your browser. You may return to this page by closing that window or by clicking on the window for this page again. Now you can buy Ray Carneys works online using Visa or MasterCard. If you pay by credit card using the PayPal button, please note in the item description or comments section of the order form the exact title of the item or items you are ordering (be specific, since many items have similar titles), as well as any preferences you may have about an autograph or inscription and the name or nickname you would like to have on the inscription. If you are confused by the PayPal form, or unsure where to enter this information, you may simply make your credit card payment that way, and separately email me (at the address below) any and all information about what item you are ordering, and what inscription or name you would like me to write on it, or any other details about your purchase. I will respond promptly. The PayPal form has a place for you to indicate the number of items you want (if you want more than one of any item), as well as your mailing address. If you want to order other items from other pages, and are using the PayPal button, you may combine several items in one order and have your total payment reflect the total amount, or you may order other items separately when you visit other pages. Since there is no added shipping or handling charge (shipping in the US is free), you will not be penalized for ordering individual items separately in separate orders. It will cost exactly the same either way. These instructions apply to American shipments only. Individuals from outside the United States should email me and inquire about pricing and shipping costs for international shipments. Clicking on PayPal opens a separate window in your browser so that this window and the information in it will always be available for you to consult before, during, and after clicking on the PayPal button. After you have completed your PayPal purchase and your order has been placed, you will automatically be returned to this page. If, on the other hand, you go to the PayPal page and decide not to complete your order, you may simply close the PayPal window at any point and this page should still be visible in a window underneath it. Problems? Unable to access the PayPal site? If you are having difficulty, it is generally because you are using an outdated or insecure browser. Click here for help and information about how to check your browser's security level or update it if necessary.